My friend Elphaba flew in today for a little visit and we debated this over our usual chamomile tea. Wicked or not, she was a dear and brought me this perfectly wicked gown to wear tonight when we go out on our annual ride. I so look forward this evening's events every year but up until now I haven't had the appropriate attire. This desperately needs some spooktacular embellishments but that will have to wait. All Hallows Eve is here so it will still do nicely for tonight as it is. When we finished our tea and the plans for our ride, we wandered upstairs to see what wickedly wonderful projects I have been working on. The sight we beheld as we walked in the room was simply eerie. There were so many of them but I only managed to capture this one in the act before she scampered away like all her friends. The evidence was clear. Lucy was in need of appropriate attire herself. The eight legged critters are really no bother but one wouldn't want them tangling up all the pretty thread, now would one? With a flick of my wrist and a wave of my wand, a fitting solution to the dilemma appeared. Oh and look, Ephalba's neighbors the Ghastlies decided to visit too. The entire clan came along for some tea including that menacing cat Sebastian and those 3 sisters whom all have names starting with "M" like me. Coincidence? Maybe? But then again, maybe not! Ghastlie matriarch Mathilda is keeping her eye on them all so they'd better beware. Daria tends to wonder off when no one is looking. 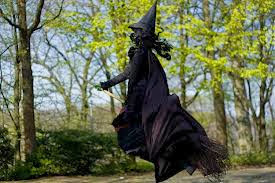 Time was getting late and more preparations needed to be done before the sun sets tonight so Elphaba was on her way. My own hat is ready and I'll be on my broom tonight before the 1st trick-or-treaters start making their rounds. My Ghastlie friends will stay behind of course and keep the spiders at bay. Many other Wicked ladies have cast their spells over their own projects so fly on your broom to their castles to see what they've brewed up for you. 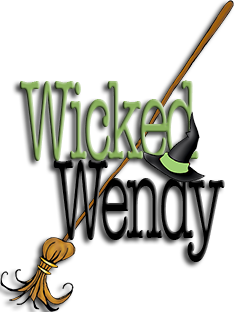 Hat's off to the spectacular Madame Samm and Wicked Wendy for yet another fabulous Wickedly good time. the Halliwell sisters thought it would be simply Charming if I offered up a little treat of my own for one of you. Saltbox Harvest, 3 half yard cuts will fly on a postal broom from me to one of you. Leave me a comment of your choosing to be entered to win. 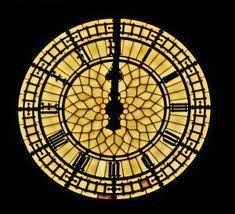 at the stroke of Midnight on Saturday, Nov 2nd. The rules are the same as always, leave your email if you are a No Reply Blogger. Happy Halloween to all and to all a simply Ghastlie night! Wonderful wicked tale with a spooktactular machine cover! Thank you for sharing. Spooktacular post michele. I love your machine cover. Thanks for sharing and a chance at the giveaway. What a wickedly wonderful tale you did weave. 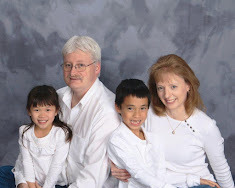 Just a great spot for a little Ghastlie delight - the family you want to hate but just can't. Hope your night's ride is spider free(no bugs in the teeth either). Love your perfectly wicked gown! Your sewing machine is very clever. 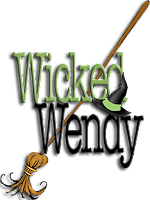 What wickedly delightful projects! Love the photography play. What an absolutely delightful post, Michele ... Wickedly Delightful!! I really like your machine cover and must make one for my own ... the Charmed sisters are very good friends of mine, I'll have you know, so obviously we run in good company :) :) Great time, Michele and awesome post! Thank you!! crowded with goulish creatures on the hunt for more wickedly fun projects. Happy Haunting! What a wonderful gown you have to wear on your flight. Have a great time. Love that fabric and what a fun machine cover that is. It is a great spider deflector. What a fun post. Hahs, great post! Thanks for sharing your projects!! Oh, I used to watch Charmed all the time! Great cover and post - you cant beat the ghastlies can you! Got to love the Ghastlies! I love your machine cover! Loving the dress too. 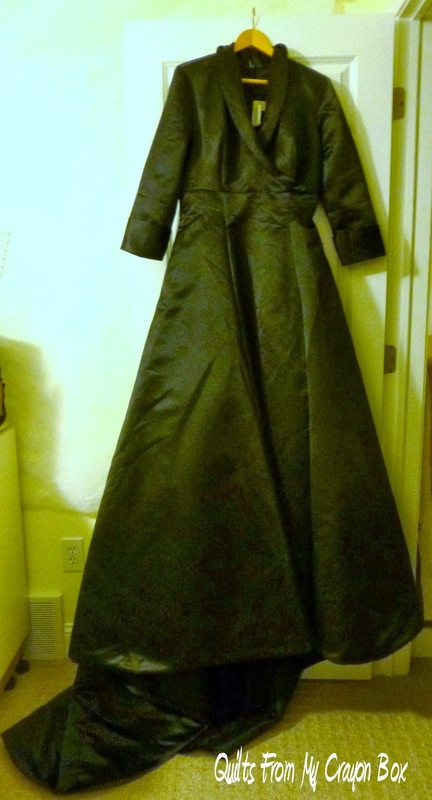 You'll look even better than Elphaba! I love her too! Granted, the Charmed sisters have better skin.....Have heeps of fun! What a fun blog post to read and I love your machine cover. I love the Ghastlies too! 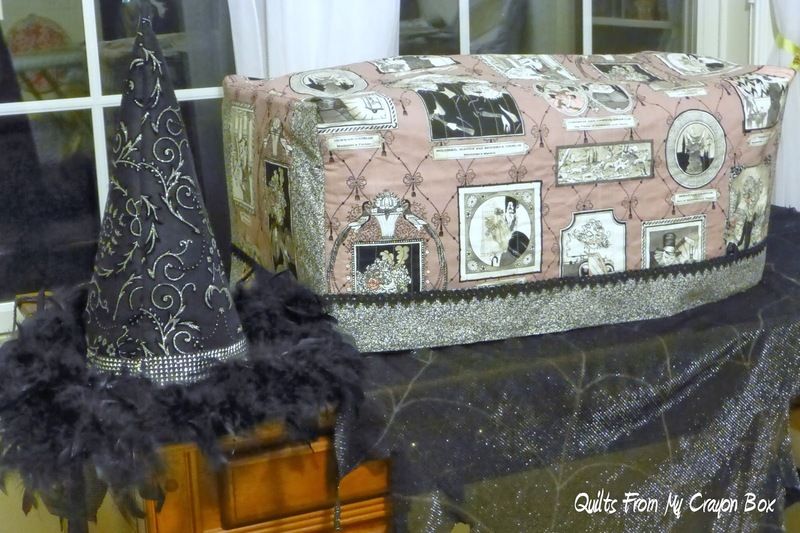 Great sewing machine cover! What a great wicked project. You photos are wonderful too. Thanks for such a wicked post. Used to love to watch Charmed with my daughters. Very nice sewing machine cover. Mine is so boring! And that spider - wow! Someone grab a fly swatter, please! Loved all your pics. Thanks for sharing. Michele what a cool idea to make a sewing machine cover to match the season. Now that is way too cool! Fun, fun, fun post! Love your machine cover! It is huge! That spider about freaked me out! I squeal like a frightened pig when I see one! ha! Love, love, love your outfit, you are going to have such a fun time tonight! I do hope we will see you in costume. Thanks for a great giveaway too. Wonderful post to read! Love that sewing machine cover, and that costume is a little too real looking to me! What a beauty your machine cover. I love your post. Very entertaining post, thanks for sharing! Your sewing room looks like it belongs to Miss Havisham. Spooky. Wow! You sure spooked me... hehehe!! 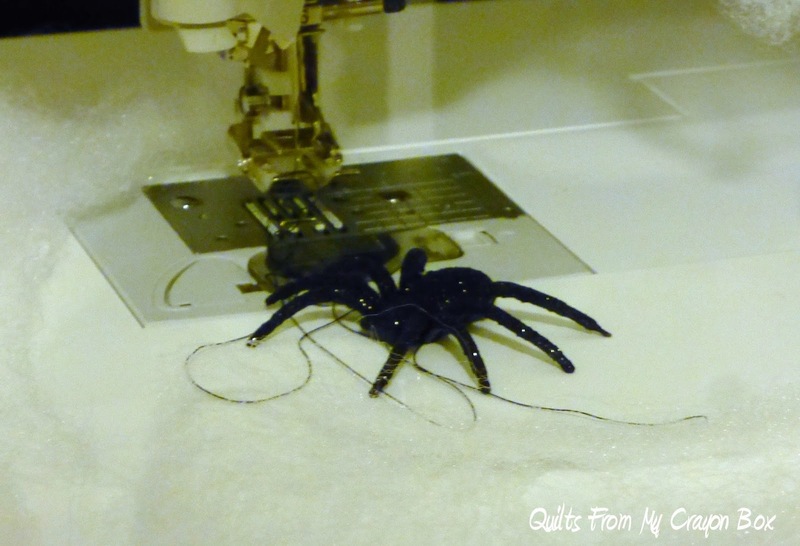 Love your sewing machine cover (without that spider!!) - thanks for sharing in the hop! Love your sewing room. That cover is so cute. I love your sewing machine cover and all your atmospheric scenes and photos! Sweet post, love the sewing machine cover. So cute! Love it! Love that fabric!!! Such a fun post! And lovely project! Thanks for the giveaway and Happy Halloween!! I love your little story! How cute! You really put some thought into this blog! I love the cover. It looks great. 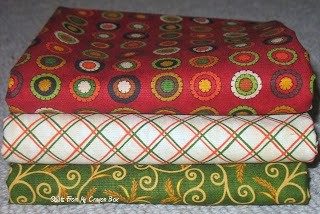 I just love the Ghastlie fabric line. 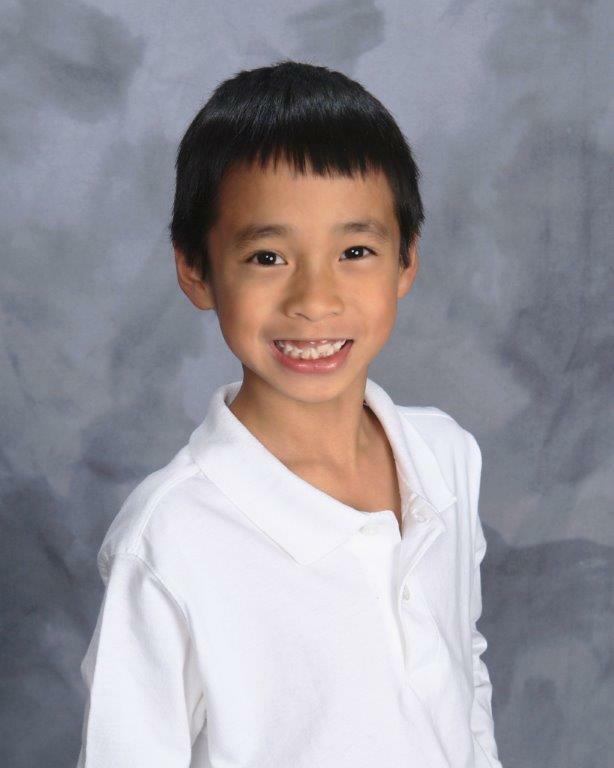 Your story is adorable. Thanks for the great giveaway. I am a Ghastlies Groupie, sew you have my complete attention. Along with your story...how can I get off this page and "drive my stick" to the next hop stop! Great post! 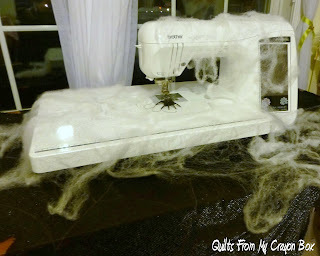 I love your post, and your sewing machine cover is spook-tacular! I really love the Ghastlies--such a perfect family group! Great job! Love your story and all the pictures. You are a great storyteller. tee hee hee...what a wicked way to keep the spider webs at bay! On our precious machines anyway! What a perfect way to use the ghastly fabric. Very cute. Cute post, loved reading it. The ghastly bunch will surely scare away all the dust from your machine. 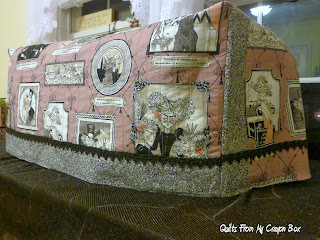 I love your post and your sewing machine cover is so wicked with the awesome Ghastlies. Thanks for sharing and for a great give away. I love the red fabric , my choice if I will get the chance to win. This was so exciting - I love anything from the play Wicked. Your display is adorable and the fabric is so so sweet. Red is my color this year. This was such a wickedly fun post to read...loved it! Your gown is beautiful and your sewing machine cover is just Ghastlie and perfect. Thanks for sharing! Loved your post, and love the sewing machine cover. Those ghastlies rock! Ghastlie sewing machine cover! Love it! Few! It's a good thing the Ghastlie family came in for the rescue, you were in danger of having a haunted machine! 8 legged beasties...oooh...! Haven't you taught them to sew for you yet? Oh, Michelle, your post is as witty and cute as your project! Thanks for the smile this morning! Wicked! You'll have to post a photo of you all decked out in your outfit! Certifiably wicked! Love what you have done with the Ghastlies! 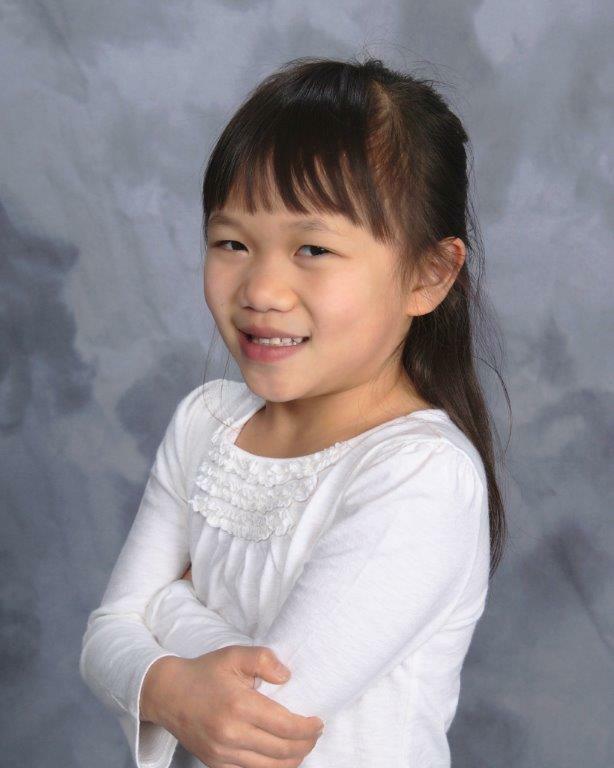 Great story and pictures, Michelle. Cracking up with the spider webs all over the machine like you had not touched in some time but obviously you had---there is the machine cover as evidence. Well done! I certainly enjoyed my wicked ride through your sewing room. Sew glad your machine will no longer be bothered with those pesky webs and spiders! Thanks so much for the entertainment and for the giveaway! I so enjoyed reading your post. You really get into the spirit. LOL Love your machine cover and had. Have a fantastic time tonight. Be safe and have fun. Thanks for this lovely give a way. Love the witches hat. I'm sure you had fun decorating the gown. Have a spooky time today. Loved your story. What a wicked sewing machine cover or should I say ghastlie. Thanks for a change to win ad for sharing! You made me laugh. Love your sewing maching cover. Wickedly fun post today! have a great ride tonight. And thanks for the chance to win. Love Ghastlie (and Salt Box). Wickedly funny today. Happy Halloween. Happy Halloween! Thanks for sharing. My broom is cleaned up for the ride! Perhaps we'll meet sometime tonight! Thanks for a chance to win. I never know when my email works with Google and when it doesn't. Look for the broom with bevwalks at aol dot com. THAT'S ME! I love those ghastlies. And you have reminded me that I need to make some covers for my machine too. Very cute. Fun post and fun story. A Ghastlie sewing machine cover is extra special and I might even see one in my future. Thanks for sharing and giving me a great idea. Loved the Ghastlie machine cover. 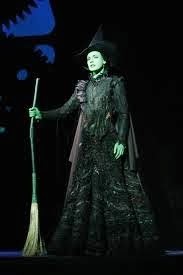 Your gown and hat are truly wicked. Have fun tonight. Thaks for sharing and for the giveaway. OMG, I loved your Halloween story, the machine cover is awesome. I enjoyed reading your blog so much. Thanks for sharing with us and for the incredible giveaway!! Happy Halloween!!! That is one cool machine cover and your post was a hoot to read! Great job! TRICK OR TREAT!! Do we get to see you in your attire? Seeing this makes me feel bad I don't even have so much as a pumpkin out for decoration at home---eek! Am I bad? Although, I have been working on a Dresden Plate table runner out of Grand Finale by Sandy Gervais--maybe I'll have it completed by Thanksgiving, just in time before snow flies around here...or at least I hope! Happy Halloween! Very cute blog! Found you by the blog hop. Yah another wonderful Ghastlies sewing machine cover! Those wicked Ghastlies have crept into all our hearts, I hope they are around for a long time Thanks for shairng. Love what you did to the sewing machine..and the cover is just perfect. Thanks for sharing! Love all your super Ghastley projects. Have fun but watch out for planes tonight. Thanks for sharing. Yikes, if ever I discover my sewing machine covered in webs and even one spider...then...here I come with the vacuum sweeper and the bug spray! I DO NOT LIKE SPIDERS! I love your witch's attire - look at the train - and the hat is fab! Your Ghastlie sewing machine cover is adorable and will be insurance against them ghastlie spiders and their webs. Happy Halloween, witchy M.
Love the Ghastlies! Thanks for sharing and the chance to win! 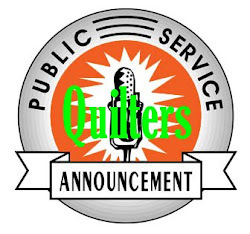 How about those Ghastlies right their onn your sewing machine. Great idea. Cutede too. Such a fun post! 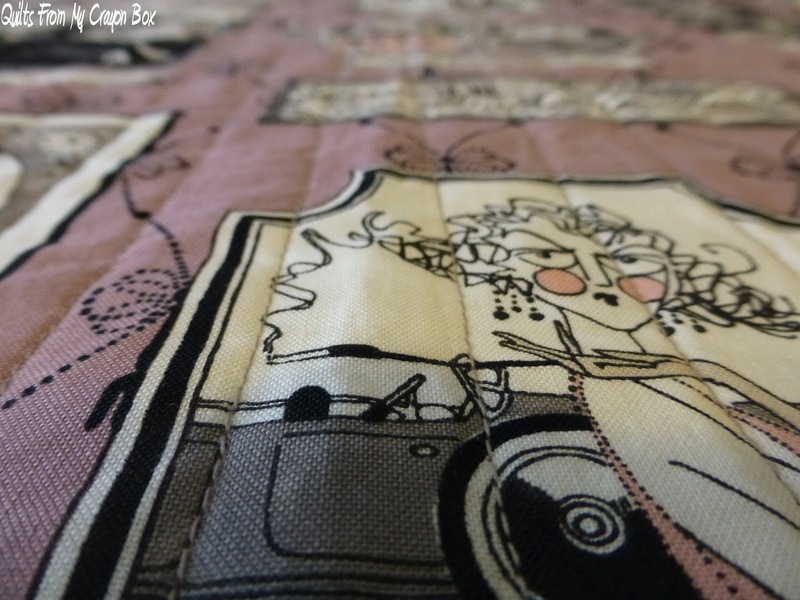 Your sewing machine cover is lovely and your gown is perfect for a night own on the prowl. How lovely was that!!!! 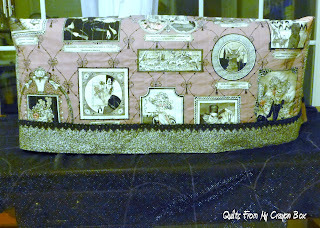 You are so creative, I didn't want it to end.. Love the sewing machine cover...Thank you for sharing. what a totally ghastlie idea…you know I never thought of making my cover longer to accommodate the table…looks frightening good! What a wickedly wonderful day !!! Love your new gown ... It's just perfect for that fight last night. those little spiders sure whipped up a great surprise in your sewing room. 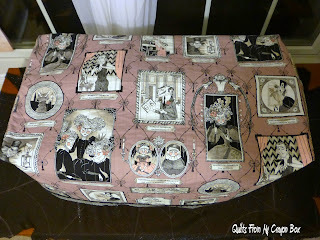 Fantastic sewing machine cover! I just love that fabric and your pictures were very entertaining. Thanks for the giveaway chance. Love your project. Great giveaway. What a spooktacular machine cover and thanks for the giveaway. Love your sewing machine cover! Thanks for the chance to win the fabric. Loved your post and the Ghastlie sewing machine cover. Thanks for sharing. Wow, your entire post was fun to read! I like the sewing machine cover. Don't let the spiders tangle up the thread into more webs. Love the Ghastlies. I know I missed the give away but I still wanted to comment on your post, it was very funny. Your sewing cover is perfect. I love that fabric.